The coastal Karnataka region figures prominently in the pilgrimage circuit of all devout Hindus - at least among the South Indians. The region houses some of the important hindu temples of the country and is also the seat of two grand schools of philosophies of Vedanta period - Sankara's Advaita (or monism) and Madhava's Dvaita (or dualism). The two schools were responsible for the ultimate decline of Jainism and Buddhism in India. It is no wonder that both our parents always had a burning desire to go on a trip there. The only thing the region boasts more of than religious fervour is its natural beauty. The region receives one of the highest rainfall in the country and come here after monsoons, you can see every shade of green from Lime to Teal and a brain numbing array of waterfalls. Hence, a staunch atheist, like yours truly, had more reasons to head here than most others with the unique opportunity to travel with the luxury of two sets of willing grand parents to baby-sit our son. This was also a watershed trip of sorts for us - the first long distance train trip for our son. If trains fail to bother our chronically motion sick son, then it opens up a variety of travel options for us in the coming years. His tummy did hold up quite well on the long train journey - so well that I was able to spend hours enjoying and photographing the lush post-monsoon Western Ghats. Our trains travel so slow that you not only can take quite good hand held snaps, but also have enough time to check the result, change the setting and shoot pretty much the same subject with time for a coffee break in between. The pick of the journey was the part where the train ambled past the roaring Dudsagar falls, close enough for you to get drenched in its mist. After close to a day, we eventually rolled into the coastal town of Murudeshwar. The town houses an ancient Shiva temple - one that houses one of the five atma-lingas. Atma-linga, for the uninitiated, is a Shiva linga representing the soul of Shiva that Ravana (the villain of Ramayana) decided to take to Sri Lanka. Few other gods conspired against Ravana and ensured that the atma-linga stayed put in India. Ravana, in a fit of rage, broke the atma-linga and one of the pieces is now housed here in Murudeshwar. But what has put this sleepy beach town on the tourist map is the new Rajagopura and a giant Shiva statue that was built by RN Shetty in the mid-90s. 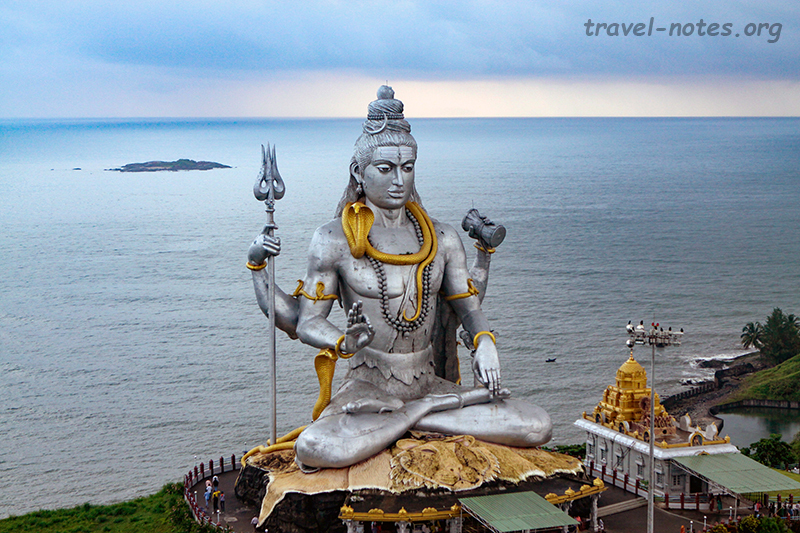 The Shiva statue is 123 ft tall and is the second tallest in the world. The Rajagopura is all concrete and hence houses a lift that takes you to the top for a stunning birds eye view of the region. 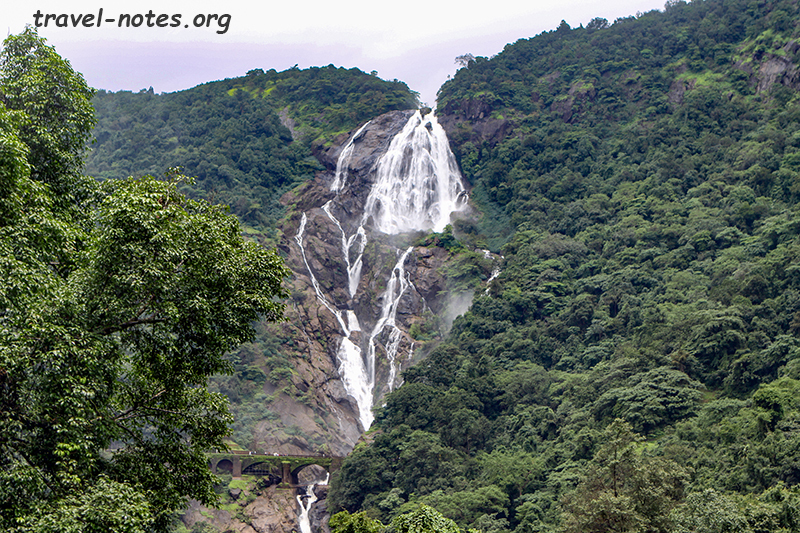 The following day, we left Pranav with his grand parents and headed to check out the Jog Falls. 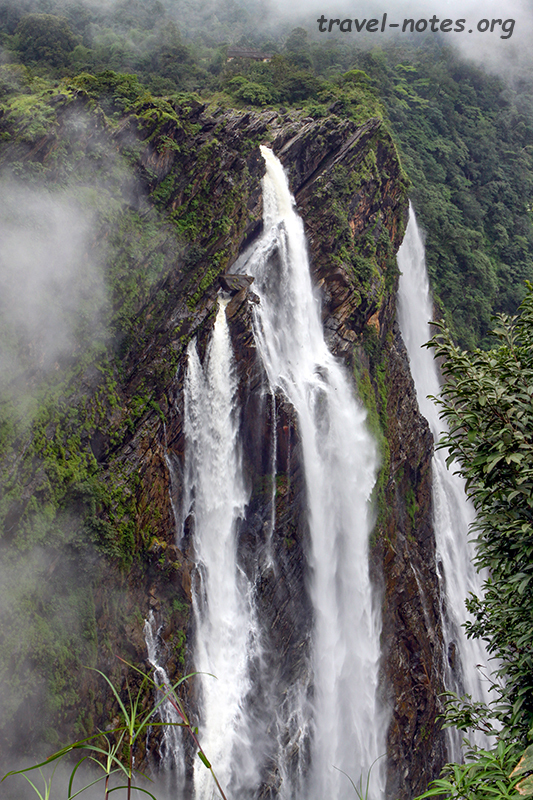 It is the second tallest plunge-waterfall in the country after Nohkalikai falls in Meghalaya. There are other taller waterfalls in the country, but they are all multi-tiered. It is about 90 kms on a backbreaking pot-holed filled apology of a road from Murudeshwar and when we reached there we were greeted with a thick white sheet of fog covering the falls. Thankfully we came early and had enough time to out-stare the fog. The fog eventually got bored and lifted. We were able to see the entire falls in parts, which meant that all we lost was the chance to capture the entire length of the 253 m falls in one photograph, a proposition we gladly accepted given the conditions that we had upon arrival at the falls. The falls are at its best just after the monsoons and thanks to a dam upstream, the falls are reduced to a trickle in the drier months. The motivation to see the falls in full glory was the only reason I chose the timing of the trip to be late September. The next day was the only day Pranav participated in any sightseeing when we all made our way from Murudeshwar to Udupi with a brief stop over at the Mookambi temple. Udupi is the home to the historic Krishna Mutt (a.k.a. Krishna temple) which was founded by Madhava (father of Dvaita school of Vedanta) in 13th century. There are a few temple-hopping circuits that can be done with Udupi as a base and we decided to do two different ones on the following two days. As all the circuits involves torturing yourself on the nausea inducing ghat roads, Pranav had to remain at the hotel and one set of elders had to take turns staying put with him to make sure nothing happened to the hotel. On the first of the two days, Aparna's parents sat flipping TV channels with Pranav while rest of us took off on a circuit. As I was part of the travel group, we decided to do the least religious of the available options - Karkala-Sringeri-Agumbe. Karkala is famous for its single stone 42 ft statue of Gometeshwara (Bahubali), the second tallest in the state after the more famous one in Sravanabelagola. It is a stiff 15 min climb up the rock cut steps to the statue, but the view from the top more than makes up for the effort. The route from Karkala to Sringeri cuts across the heart of Kudremukh National Park, but we weren't lucky to spot anything other than an odd peacock scurrying away from the noisy roads. Sringeri is the place were Sankara (father of Advatia/monism school of Vedanta) found one of his four mutts in 8th century AD. 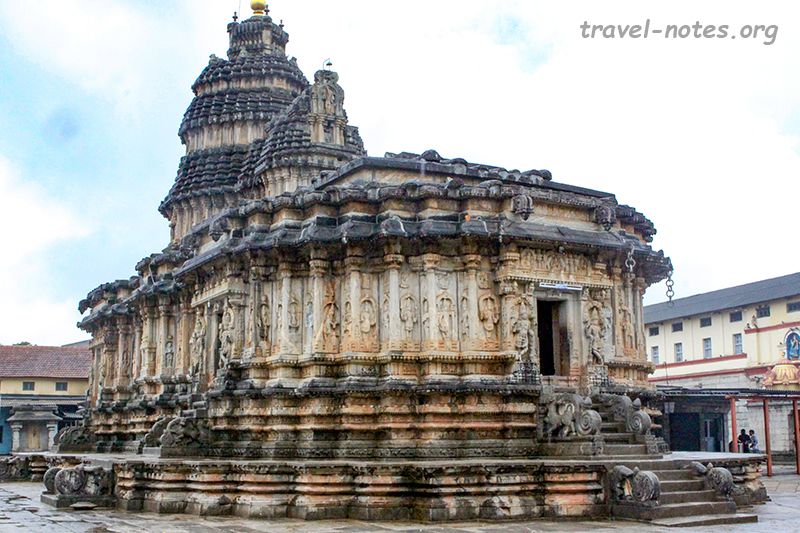 The most eye-catching structure there is the 14th century Vidyasankara temple. It was built on the burial site of the 10th guru following Sankara. The temple is one of the first architectural masterpieces of the Vijayanagara empire. The exterior walls of the temple is adorned with sculptures depicting Hindu and Jain myths and the inner hall is supported by 12 pillars representing 12 zodiac signs. The construction is such that each pillar is illuminated by the direct sunlight for the month of the year corresponding to its sun sign. Agumbe receives the second highest rainfall in the nation after Cherrapunji and it is the heart of King Cobra country. The only thing you can do here (i.e. if you are just driving through in a hurry) is to stop at the sunset point and shoo away the monkeys. We did the former, but lost to the monkeys while attempting the latter. Click here for more photos from the trip.